Have you ever run out of an ingredient when you needed it most? A few weeks ago, Mr. Crumbs promised the kids to make his favorite oatmeal chocolate chip cookies. His problem? We didn’t have any all-purpose flour. We had oats (for oat flour) and a few different whole grains to make our own whole grain flour (specifically, we had einkorn, spelt, kamut and wheat on hand), but no all-purpose. He had already committed to cookies, so he couldn’t back out. But running to the store for just one item is a big no-no. Rule number one in a frugal kitchen is to substitute whenever possible and NOT go to the store. Especially when it’s just for one item. Especially when it’s a “want” and not a “need.” Especially when you have something else on hand that will work just as well (even if it slightly alters the outcome of the recipe). Mr. Crumbs called me into the kitchen and presented his dilemma with two sets of pleading eyes standing by his side. I suggested making the cookies using oat flour, whole wheat and spelt. We’ve used that combination before and it’s worked well. Ok, he got me there. We’ve already switched out half the flour for whole grain, added coconut oil for some variation of healthy fats, reduced the sugar and in this particular batch he was using dark chocolate instead of semi-sweet. For a man who lived on hot pockets and coca-cola through college, this was a pretty big improvement. I certainly didn’t want to ruin his progress! So I started thinking… all-purpose flour is essentially a whole grain, minus the germ and bran. What if we ground flour and then sifted out those two portions? Call me a genius folks, because it worked! I tested it again on another day, took notes (and pictures) because I knew you guys would want to see how to make your own all-purpose flour too.. you know, in case you’re in a pinch and you have the urge to make cookies too. Grind 1 cup of whole grain berries on the finest setting of your grain mill. If you don’t have a grain mill, you can grind your own flour using an inexpensive coffee grinder and food processor. Sifting Round One. Set the sieve over a large bowl and sift the flour. After a couple minutes, you will see the germ and bran remaining in the sieve and the endosperm in the bowl. Place the germ/bran into a separate small bowl. 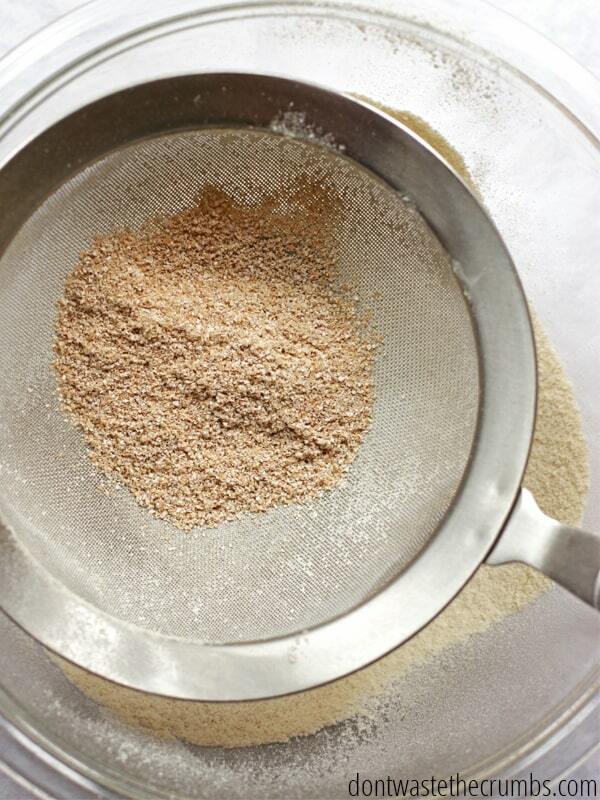 Repeat with the remaining freshly ground flour until it has all been sifted. Sifting Round Two. Repeat the sifting process again, but this time use the flour that has already been sifted. You will again see the germ/bran separate in the sieve. Place the germ/bran into a separate small bowl and repeat the sifting process until all the freshly ground flour has been sifted twice. Store the flour and germ/bran in separate containers. 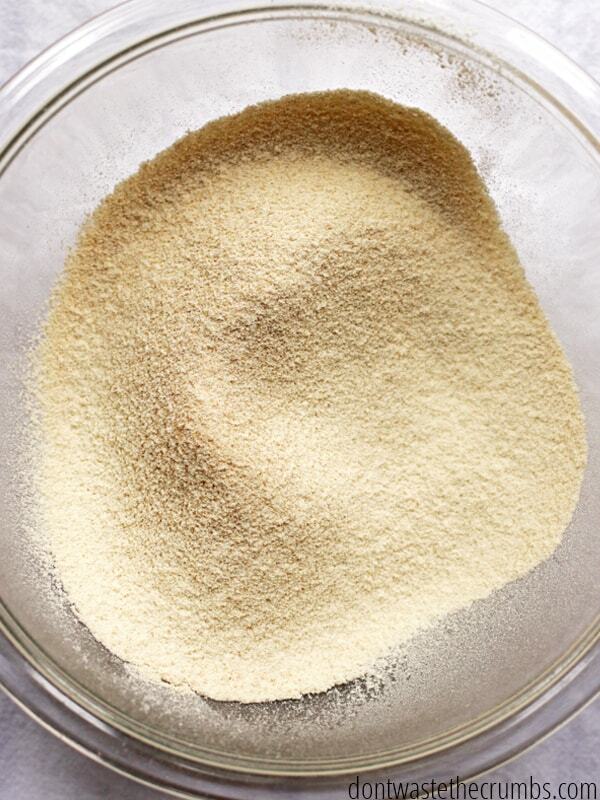 The flour will stay fresh in the pantry for up to one week, or you can refrigerate/freeze for up to 2 months. Store the germ/bran in the refrigerator or freezer for up to 2 months. You don’t have to sift the flour twice, but I found that this provided a consistency more like all-purpose flour than just sifting once. You could sift a third time, but that would be a personal preference. Two sifts did the job just fine. If the finest setting on your grain mill isn’t very fine, or if you’re using the coffee grinder/food processor method, you can still make all-purpose flour using this method. You will end up with less all-purpose flour and more germ/bran, but you can repeat the original grinding process and sifting process above to get more out of that first cup if you’d like. The method above uses just one cup of flour, but you can start with more if you’d like. I just chose one cup as an arbitrary amount so that I wasn’t making more flour than I actually needed. The germ/bran contain the majority of the fat of the grain berry, so it’s important to keep it stores in the refrigerator or freezer. 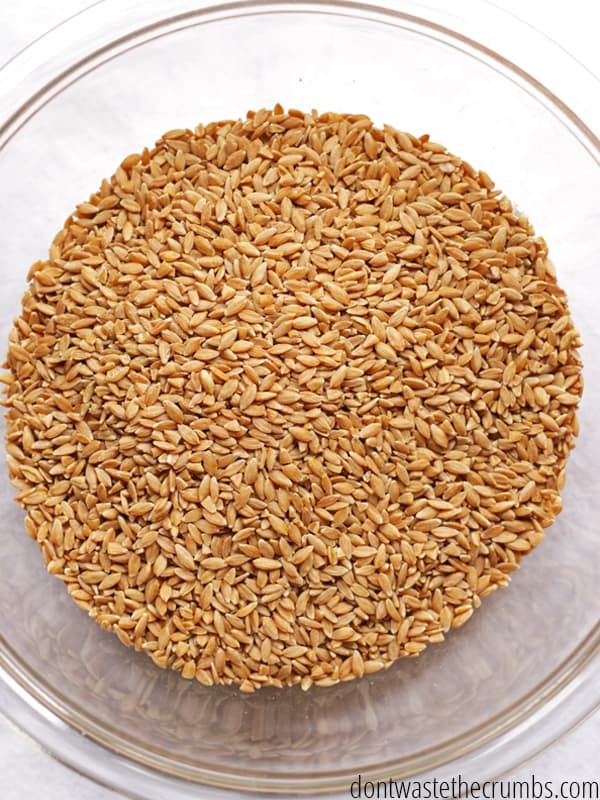 Use the germ/bran in any recipe that uses whole grains, other than a bread recipe. So homemade granola bars, oatmeal, protein bars, even in cookies or muffins in small batches is fine. You want to avoid adding to the bread because the extra weight of the germ/bran will affect the rise of a whole grain bread recipe. For many of you, making all-purpose flour is going to be too much work. You’re working two jobs, short on time as it is or don’t have the patience to wait for the coffee grinder… I get that. But if you have the time, I urge you to at least give the idea some thought. Most of the all-purpose flour on store shelves are either laden with synthetic chemicals to supposedly make it healthier or drenched in chemicals to make it white. Some all-purpose flours are both! If it’s possible to avoid these chemicals and additives, then we should at least give it a shot. However, if you fall into the short on time/don’t have equipment category, I recommend buying an all-purpose flour that is not enriched nor bleached if at all possible. There are a few brands out there, but Hodgson Mill would be one that I’ve tried myself and can recommend. Do you own a grain mill? Do you grind your own grains? What type of flour do you use in your favorite cookie recipe? Hey Kathy, can i replace any recipe that contains All-purpose flour with homemade flour like soufflé, chocolate lava cake etc.. Or does it behave too differently that ill have to search for specific recipes for homemade flour? Hi, given that I’m not altering the structure of the wheat berry can i make any recipe that contains All-purpose flour with homemade flour instead? like chocolate lava cake, shortcrust pastry etc.. Or does it behave too differently that I’ll have to search for specific recipes for homemade flour? Just what i wanted to hear, thank you! Thank you! I’ve been looking for a sub for store-bought AP flour, as you never know how long it’s been sitting around. I was also told that, by day 3 of grinding (unless you store in the freezer), that the nutritional value is all but gone and you’re left with glorified gluten. I don’t know how true this is, but freshest is always best. I have a Vitamix, and I have the dry grain container for making flour. I’d love a Nutrimill, but this was a less expensive option for me – not to mention one less appliance in my cabinets. i have a very large glas canister for my kitchen counter. I purchase u bleached AP flour-organic when possible. Usually either White Lilly, as I live in the south, it is THE BEST, or King Arthur. I will mix a 5lb bage of the AP with about 2.5-3lbs of whole wheat. I use this for all of my recipes, even my biscuits. Everything still comes out beautifully light and does not change the overall taste of the final product. I hadn’t thought about combining AP with whole wheat ahead of time. Thanks for the time saving tip Katherine! 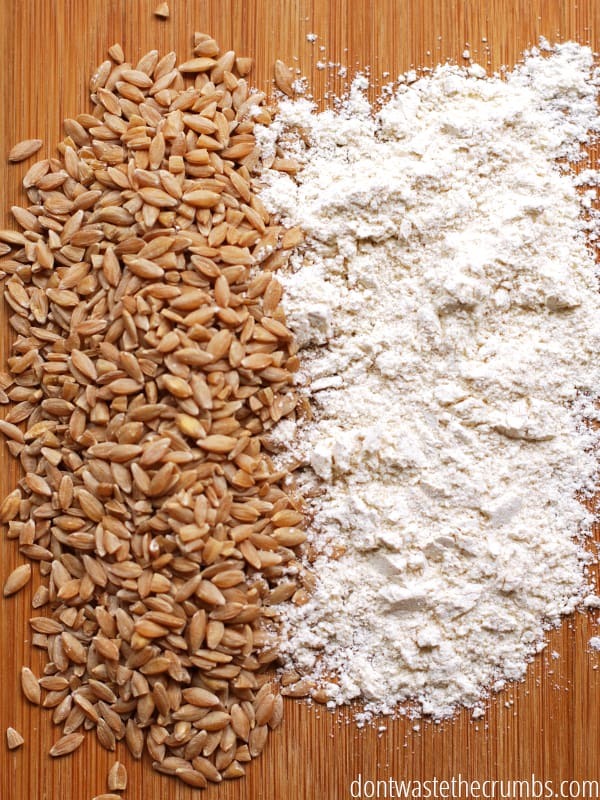 If you can find hard white wheat it can be used in place of AP flour and you won’t notice the difference. The hard red wheat, however, has much more bran. Thanks for letting me know that a quick sifting will work in a pinch. I grind my own whole wheat flour from organic berries because of all the horrible pesticide and herbicides that regular farmers spray on their crops. I know it’s more expensive but I budget it in. The flour is so much better tasting than commercial WW hour. 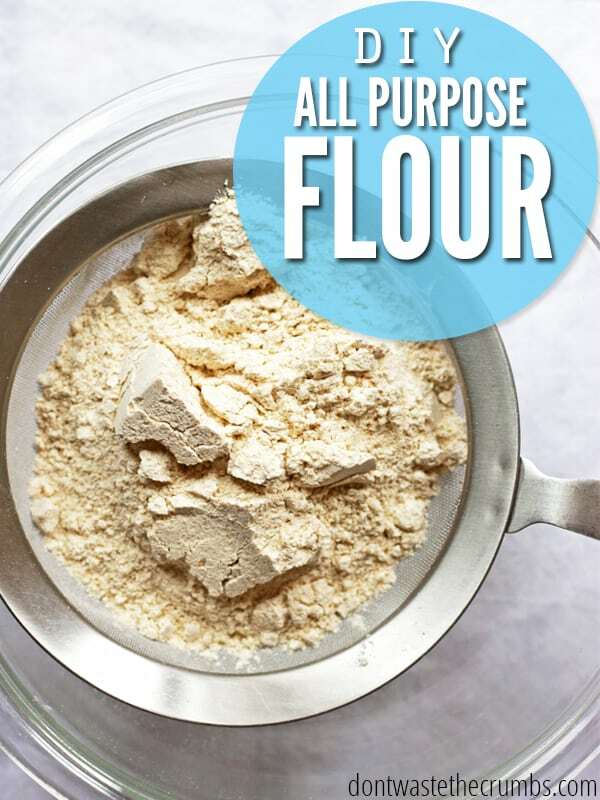 I like the tip about combining it ahead of time with AP flour. I will try this with bread flour too. I was wondering how you would use the leftover germ and bran after the sifting. Honestly, if I’m going to all of that work, I want to be able to use every bit! Cereals, mixed with oatmeal? What about bars? We use the leftover for making a type of food called kitchidi. It is a type of porridge that can be prepared using vegetables and pulses. It can be eaten by babies as well. Its a better ulternative to gooey foods that is given to babies. Its full of nutrition and introduces them to wide variety of flavours. Thank you so much for this. I also bake with Einkorn. A while back Jovial started coming out with recipes that called for their AP flour to be mixed with the ground wheat berry flour. Its very expensive ($3.00 a pound) and as I have a very expensive grain mill – and we cook all our own food from scratch (We are vegan farmers) – I find it counterproductive to go backwards, both monetarily and nutritionally. Plus, we eat a LOT of baked goods each week – buying AP flour from them would break our budget big time. So this information makes me peachy happy! Now I have to come up with some kind of machine that will shake the sieve for me – LOL. Personally, I am starting to have some ethical issues with Jovial. Hybridized wheat is planted 30 seeds per square foot and bears “perhaps” 30 seed heads. Einkorn on the other hand, bears approximately 800 seeds per s.f. So I don’t see Jovial as being a flag-bearer for the cause of healthy wheat – they are just becoming greedy. This might be a stupid question, but if u have a sifter, could I use that to sift it instead of the sieve? Or does the sieve separate it better/leave the germ/bran behind more than a sifter would? Thanks! No such thing as a stupid question Jenny! For our purposes, a sieve is the same thing as a sifter. Enjoy! So, if I sifted my whole wheat flour from hard red berries and nothing stays in the sifter, what does that mean? I was just reading today about yet another salmonella outbreak in fruit. There was a link to another article about the foods most likely to carry salmonella. I was surprised to see raw uncooked AP on the list. They said that even just getting it on your hands, if there is salmonella in the flour, can make you sick. About 90% of the ingredients and foods I use or eat are organic. But I’ve seen those even organic get salmonella over the last few years. I mainly use Einkorn or Spelt but I do buy their AP because I get lazy. So was very glad to find you have already solved this problem. AND I was just mourning the fact that I don’t have wheat germ for my home-made ice cream. Think I will toast some after I sift and see what happens. Thanks again! Thank you for this post!! I’ve been reading that enriched flour contains folic acid, which is actually a synthetic chemical (not the real vitamin, which is called Folate) that makes our bodies have to work harder to process it and actually does much more harm than good. I looked up unenriched white flours, and they are expensive. This is a great way to avoid enriched white flour! Can you tell me what brand of strainer you are using? I can’t find a mesh strainer fine enough. The bran falls through.